Stick with MISS REPRESENTATION, please. I ask this because the introductory few minutes are so thuddingly repetitive and so full of what's wrong with the media vis-à-vis women that the movie looks more like the problem than the solution. Yes, I understand that women are angry at how they are almost always portrayed, but using two or three really choice examples of this might work better than flooding us with 20 or 30 of the same old/same old. 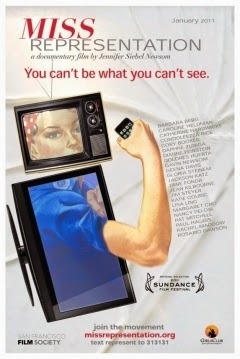 Once it calms down, however, the documentary -- from Kimberlee Acquaro and Jennifer Siebel Newsom (the latter, who narrates and is featured in the film, is shown below) -- grows more interesting by leaps and bounds. Once we get into some of the shocking statistics, the facts and figures marshaled here are often fascinating, and so the movie definitely hooks us. Particularly interesting is the look at post-WWII life in the USA, in which the "re-domestication" of women (after their livelier and necessary time on the assembly lines helping the Allies conquer the Axis powers). The late 1940s and 50s were pretty dreadful to women in terms of their empowerment. 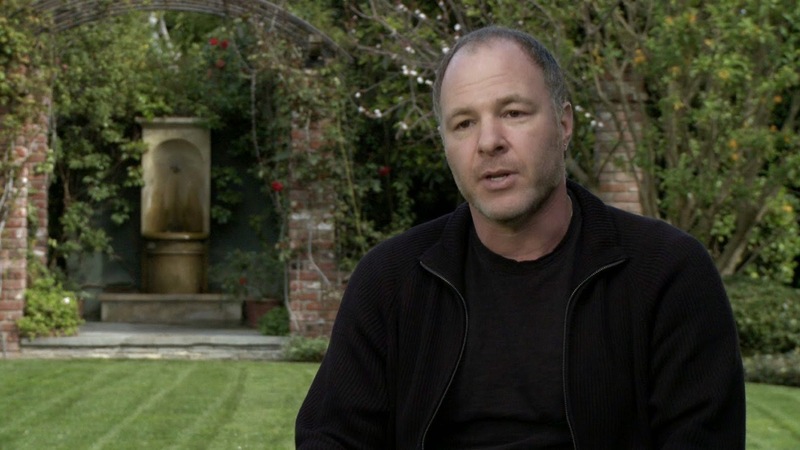 The documentary does a nice job of combining, archival footage with present-day (well, 2011, when the film was first seen) interviews with various women and a few men (Jackson Katz, above, is particularly telling on the subject of machismo). Along the way we hear from everyone from Cory Booker (on spiritual healing!) and Glora Steinem to Pat Robertson and Rachel Maddow (above) -- who comes off as particularly bright and well-spoken. (Mr. Robertson's statement about "women's agenda" is both hilarious and scary.) We also hear from actresses such as Geena Davis (shown at bottom) and Daphne Zuniga, both of whom have pertinent contributions to make. The use of one of these interviewees, however, does a lot to sink what the filmmaker seem to be trying to achieve. 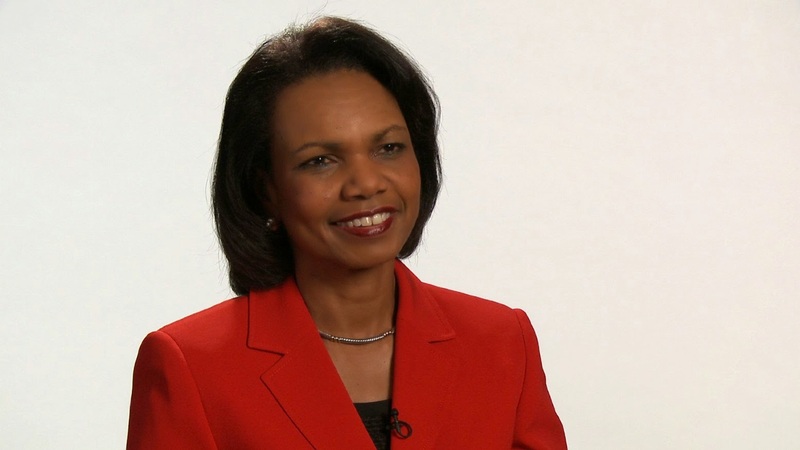 When you place a former Secretary of State for the George W. Bush administration, Condoleeza Rice (above), as any arbiter of fact or truth, you're in big trouble. Ms Rice proved herself a liar and a war criminal, as part of that ignoble group who led our country into an unnecessary was in Iraq by virture of lies told over and over again. The whole pack of them ought to be serving time, if not shipped off to the mideast and forced to fight on the ground the war they started that has now taken so many American and Iraqi lives. What does seeing Rice used here as some sort of "model" say to women? Yes, she is intelligent and she was powerful, but ignoring what she did is reprehensible in the extreme and as hypocritical as it would seem possible to be. That said, there is plenty to chew on in this documentary that may be three years old but whose subject remains as timely and unsettling as ever. You can see it now via Netflix streaming and other venues.